The Faleolo International Airport is the major point of entry into Samoa if you intend to fly in to the country. The airport is around 45 minutes away from Apia. Faleolo is well connected to Fiji, Australia and New Zealand. If you are flying in from the American Samoa, then you can fly in to the Fagalii airport. Arriving in the morning will give you brilliant views of Samoa. You can also get in to Samoa by a boat, which is operated by MV Tokelau, from Tokelau. There are four main ways of moving around in Samoa. Note that from 2009 onwards, traffic has been moving on the left side of the road. Taxis are the best way to move around; they are inexpensive and are available in plenty. You can also rent a car, but you will need to first obtain a driving license; international license in not recognized. If you want a memorable traveling experience, then try riding a bus. There are no set schedules and buses leave only after they get filled. 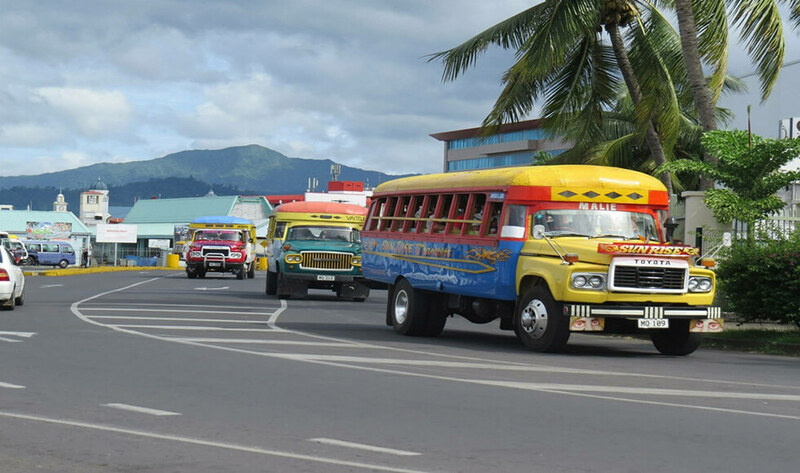 Buses are available on both Savai’i and Upolu. The other way to move around is by cycle; before deciding to cycle around, keep in mind that there are a number of steep uphill sections on both islands.